Summer is almost upon us. School is letting out. Mothers are trying to figure out how to keep children occupied, thus calm(er). Schools assign summer reading for kids recommendations and many schools have followup activities and quizzes in the fall. As a public and private school teacher turned homeschool mom reading is a daily must for my children. The problem comes in determining how to keep enough books around so they always have something new and different to read without running up a huge bill at a bookstore. Of course you have the public library and perhaps even the school library or a college library nearby. College libraries have children’s literature sections. Whenever we check out books we save the “receipt” and keep it with our calendar. We mark a day a few days before the actual return day on the calendar so we have time to round up any stray books. Once the children tire of the library books we head to a bookstore. Now, before we go in we prepare with notepads or paper and pen as well as schedule extra time for this stop during our errands. The idea is not to go in and buy full price brand new books but to look for interesting books. Once a child has found a series or several titles in which they are interested we note the information. If all are fine (noone needs a nap, ect.) and we have the time we will take advantage of the chairs, beanbags, sitting area and let the children simply read right there in the store. Once we get home we get on the computer to find books that they saw in the store. Quite frankly there are multiple sites that sell books at drastically reduced prices. If we have the funds available we MAY get some of the books on their lists from one of those sites. Most of the time we look on the bookshelves at home and find books that the children are no longer interested in or that they have outgrown. These books then get listed on paperbackswap. I am not affiliated with the site but have used it for several years. Indeed it is an aid to spring cleaning, preparing for the summer and saving lots of money. 3. Chuck E. Cheese – Kids can earn 10 FREE tokens every time the 2-week reading chart is filled out. Just fill out the form and bring it in to claim your free tokens. 4. Pottery Barn Kids – When a child completes their reading challenge, they will receive a FREE gift. 5. Scholastic Summer Challenge – Kids can log their reading times into their system to compete for the World Record! 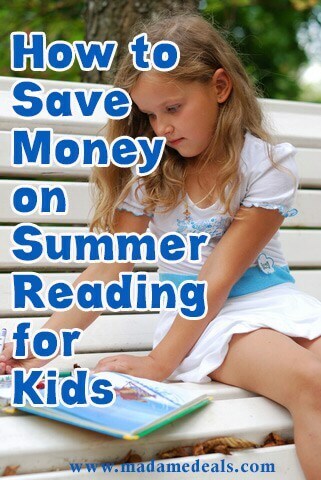 Thanks to Rachel Case for sharing these summer reading for kids tips! Are you a traveling with kids this summer? Check out these Travel with Kids Tips here and here.